Yorrick Brown is the only human survivor of a planet-wide plague that instantly kills every mammal possessing a Y chromosome. He does not know why and his entire world goes for a toss in this mysterious circumstance. Interesting isn’t it? That’s what I thought as well and loved the premise. When I picked up the book and got done with the first volume, I loved it even more. The story is unique and begs to be a television series. The illustrations by Pia Guerra are sharp and display the post-apocalyptic world (well almost) quite interestingly. Yorrick then begins his journey with his pet monkey, a young geneticist and a government agent to go find his girlfriend halfway across the world and to figure how he happened to be the last man on earth. Just for the premise, I would say you have to read this comic series. Brian K. Vaughan does an amazing job of this and this is before Saga was worked on. It is only a collection of ten volumes, so it does end somewhere. The narrative is so fast that there were times I had to go back and forth, just to make sense of it all. All that I can say is that the series will not disappoint me and yes I say this without having read the other volumes. I did pick up two, three and four right after. Go on and read this one. 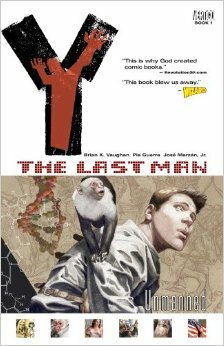 This entry was posted in Books, Comics, random house, Vertigo Comics and tagged Apocalypse, Brian K. Vaughan, End of the World, Pia Guerra, random house, The Last Man, Vertigo Comics, Y, Yorrick on October 1, 2015 by thehungryreader.